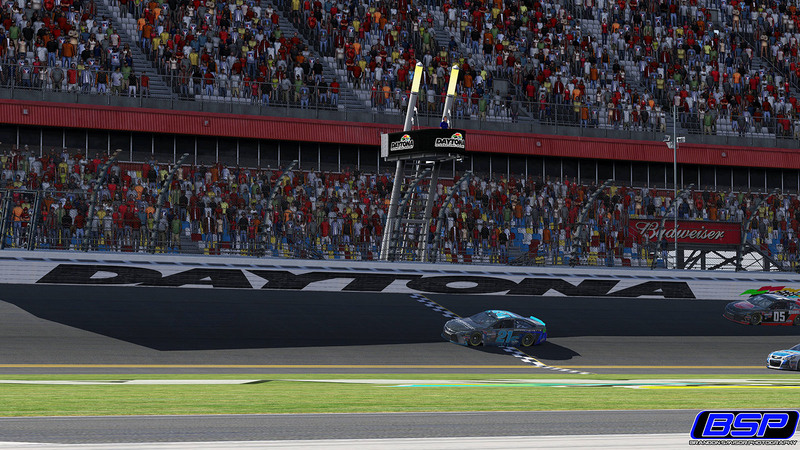 Allen Boes held off a hard charging Brandon Schmidt on the final restart Tuesday night to secure his second career Nascar Peak Antifreeze Series powered by iracing.com win in just his 16th career start. Leading only 15 of the race’s 100 laps, Boes stayed in the hunt all night before propelling to the lead at the very end to claim victory in the season opener. The race began with pole-sitter Justin Bolton leading the field to green, signaling the start of the 2016 Nascar Peak Antifreeze Series. Bolton would lead the opening 9 laps before The TEAM’s Cody Byus worked the air on the outside, passing Bolton to complete the first lead change of the night. The field began to settle in as drivers quickly discovered how slick the relatively new surface was becoming. Some began to fall back, struggling with loose cars. While others, including the likes of Ray Alfalla, Allen Boes, and Taylor Hurst surged toward the front and raced their way into the top 10. As the comfort level grew, the race for the lead was on. Lap 23 marked the race’s second lead change, when GaleForce’s Nick Ottinger soared by Bolton on the outside lane. Ottinger would then surrender the lead to Allen Boes for one lap, before retaking the point on lap 25. Ray Alfalla would assume the lead on lap 26th, triggering a chess match up front with both Allen Boes and Nathan Wise for track position. Boes would then retake the lead, swapping back in forth with Wise before Tyler D Hudson came to the front and captured his share of the top spot on lap 33. As the hot track surface left drivers screaming for the welcoming grip of new tires, pit stops began on lap 33 under green as Patrick Crabtree led the field in. It was through this exchange that Slip Angle Motorsport’s Bryan Blackford advanced his way into the first position, drafting with teammate Alfalla as well as Last Row Motorsports alliance drivers PJ Stergios and Chris Overland. These four would anchor the field for the next 10 laps before Hudson, Boes, and Michael Conti used the draft to catch back up and reform the lead pack. Early adjustments implemented by the teams during their pit stops gave drivers the needed grip for the rest of the race. Different drafting packs began to form, with the lead pack summoning up to 15 cars. This would however be interrupted when Blackford’s #33 Wendell Scott Foundation Ford lost control on the front straightaway and came to a halt at pit exit near the halfway point in the race. Bryan was then hit hard by the #34 of Matt Bussa, effectively ending the night for both drivers. After the mid-race caution, the drivers knew the tone of the race would change. Two different strategies began to form, with some drivers electing to go full pace and race hard while the other group of drivers were content with laying back to save fuel. The main pack continued battle throughout the green flag run until lap 80, when a swarm of cars came to pit road to take on just enough fuel for the finish. These drivers were then followed by a few more takers, completing the round of pit stops. By now, tension rose between drivers and their spotters. The race was between the drivers trying to make it to the end on fuel and those who had already pitted. Brandon Schmidt’s #3 car took the reigns of the field until just under 10 to go, when Deadzone Racing’s Allen Boes regained the crowned jewel of first place. It wasn’t until 7 to go when a late race caution halted the field once again. Those involved included the likes of David Rattler, Kevin King, Nicholas Johnston, and former series champions Michael Conti and Kenny Humpe. And although the caution was a welcoming sight for the drivers short on fuel, none elected to visit pit road and opted to race this final restart on old tires. When the field took the final green with 2 laps to go, everything went according to plan until turn 3, when several drivers lost grip and made contact with the wall. This ultimtely ended the race, when a stack up occurred mid pack resulting in the #28 of Casey Tucker being turned from behind, causing a big wreck. The thrilling conclusion handed Allen Boes the win and the early points lead. “I really don’t know where to start,” said Allen. “The last few laps of the race just saving fuel, trying to make it to the end. And with that caution coming out…I didn’t know what was going to happen.” Nonetheless, Boes proved he has the potential to be an early championship favorite. But with a long season ahead, there’s still time for other challengers to mount a comeback and dethrone some of the series’ greats. That’s all from round 1. 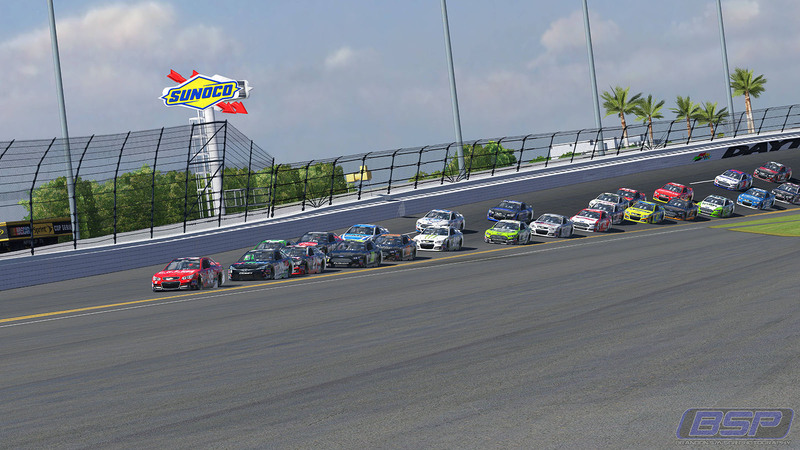 The series will next take to the track next Tuesday, March 1st for round 2 at the Atlanta Motor Speedway. Atlanta has always been known to be one of fastest speedways on the schedule, prompting high-speed racing action. Will we see another surprise winner? How gradual with the tire fall off be on the old rugged surface? Be sure to catch all the action on iracing.com/live, as the world’s best oval sim racers take on AMS!